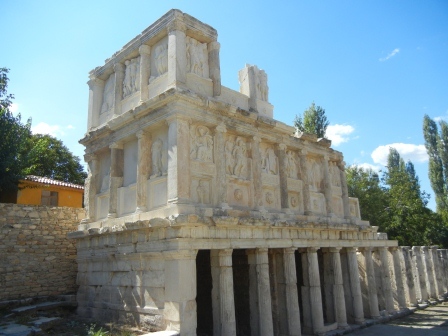 Oct 2 – I love Afrodisias! After the 5:15 AM wake-up call and packing 2 days of clothes and stuff into backpacks, since Pegasus air charges 3 Turkish lira/kg for any checked bags we got on the 6AM shuttle to the airport. Then waited until 6:40 AM (2 hours before the flight) to get checked in and went right to the gate. 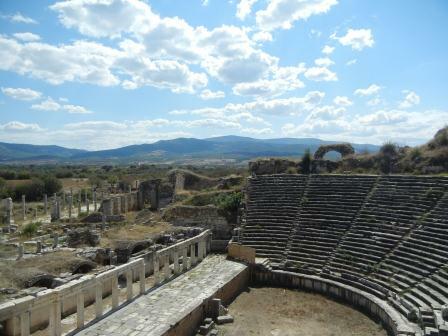 We slept on the flight and then got right in the rental car for the drive to Pamukkale. Pamukkale is a hot springs with travertine terraces and open pools. They have done significant reconstruction over the past few years to both protect and preserve the formations and also making them more accessible to people. Some of this change has been good, but in many guide books it suggests that this is a place of “natural” beauty and great scenery, while the reality is a little different. I am going to put Pamukkale in another post. 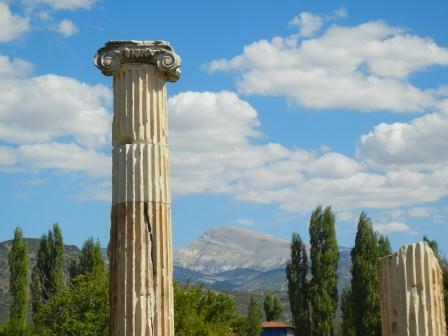 However, on the way to Pamukkale, we saw the mountains and natural beauty and we took our guidebooks suggestion to go see the ruins at Afrodisias. This was a great suggestion and may even be my favorite place on the trip thus far. 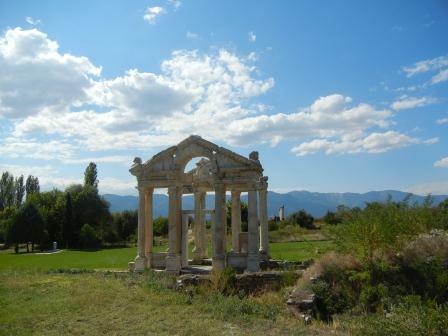 Afrodisias (Aphrodisias) was a Greek city with a temple dedicated to Aphrodite. 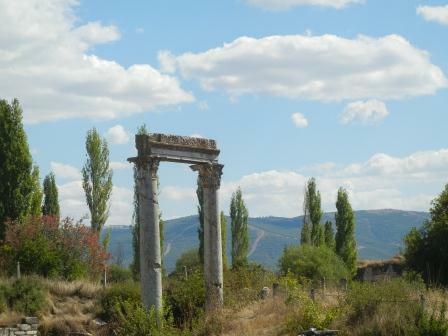 Most of that temple was destroyed to become Christian church and bishops house. As it has not been as popular or convenient as many of the other sites it is also almost a private tour. After taking a tractor over to the entrance we started with the first building, the Sebasteion. This was originally 3 stories and was covered in stone reliefs with various gods and rulers. Many are in the process of being restored and then replaced to make the building appear as it was when first built. You can see the extensive work thus far in the museum. We then went to the theatre which was really cool. Earl actually went onto the stage and the acoustics were amazing. I could hear him speak in a normal voice when I was on the very top row. The views from there are amazing as well. I have a lot of pictures of the theatre, so this one is my favorite. 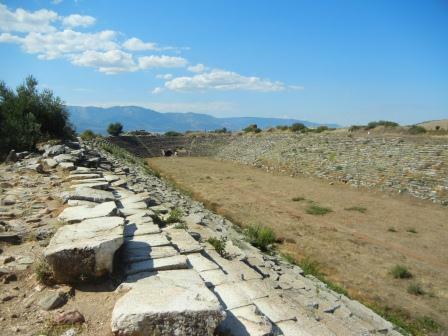 We then saw the ruins of the temple itself and the baths. Most of the temple had been destroyed and re-built to make a church and bishop’s palace. This is where you may want to check out Earl’s picture posts to see more, but I loved these pictures. After all of this walking, we got around to the gates of the temple,which are one of the traditional highlights. It is also one of the only places where they water the grass around it. It was fun to watch Earl try to get close to them without getting wet. This view also highlighted the great weather and gorgeous blue skies that we had and actually have been lucky so far to have on this trip. To end Afrodisias, we went to the museum which was great, especially since Earl got to take pictures inside. We grabbed a quick snack and drink to make the drive to our next stop Pamukkale. (There are a lot of pictures with that one too, so it will get its own post).